Habitat: Upland, Mountain. It often grows in grassy areas. 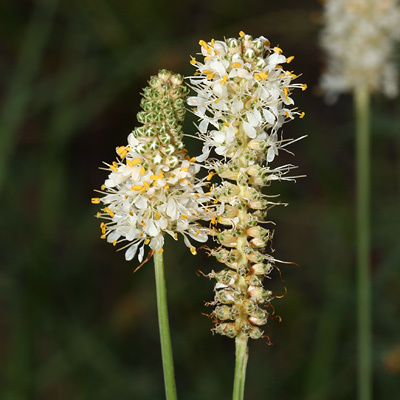 Description: The small flowers begin to bloom in a ring at the base of the up to 3 inch (7.6 cm) long, terminal flower spikes and will later bloom closer to the top of the spikes. The leaves are green, alternate, and pinnately compound with 3 to 9 lanceolate leaflets. The leaves and stems are hairless. 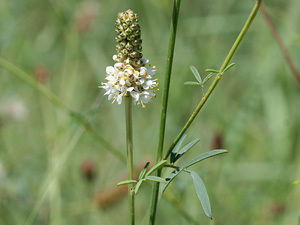 The similar Whiteflower Prairie Clover (Dalea albiflora) has fuzzy leaves, stems, and flower spikes. Butterfly Plant – The flowers attract butterflies and other insects like bees and flower wasps. This plant and the similar Whiteflower Prairie Clover are perhaps the best butterfly-attracting plants found here and would make great additions to butterfly gardens. Wildflower seeds are commercially available.